Amid the expanse of cement, bridges and skyscrapers in the big metropolis of Chongqing, in Shapingba District, very close to Chongqing University campus A, a little ancient town still stands: Ciqikou (for the Chinese 磁器口), literally “Porcelain Port, formerly known as Long Yin. The town is located on the West bank of the Jialing River, not far from its confluence with the mighty Yangtze river, with authentic as well as restored buildings, where you can find the local residents who continue to live in the traditional way, unaffected by modern life of larger towns and cities. This town is an essential step if you go to Chongqing, so we decided to go visit this little pearl of the city and share this experience with our readers. According to the history, Ciqikou was built during the reign of Emperor Zhenzong of Song Dynasty (year 998–1004), and later on, during the Ming Dynasty (year 1368–1644), it became a commercial port and market town shipping commodities by land and water. Its name comes is due to the production of porcelain, which characterised the town during the Ming and Qing Dynasties (year 1644-1911). Today, a thousand years after its foundation, the town remains a symbol and microcosm of old Chongqing and it has preserved its ancient streets, with many tea houses, restaurants, shops for craftworks and souvenirs. We arrived in Ciqikou late in the morning and, although it was a week day, the area was crowded. Our tour started from the top of the town, where it is easy to meet many small artisans specialised in porcelain and carved products made from bamboo and wood. One of the must-do in Ciqikou is tasting the four famous local food specialities: Jiaoyan peanuts (peanuts with pepper and salt), Maoxuewang (duck blood curb in chili sauce), Zhangfei dried beef and Ma Hua (fried dough twist). Walking along the road leading to the river, we came across the area of the shops that prepare Ma Hua. While trapped in the melee of people queuing to buy their snacks, we were attracted by the nice smell, so we decided to do the same, choosing the shop with more customers. Mrs Yang, the owner, told us he has been running the business for 20 years, selling 500 kilograms of Ma Hua every day, and even more than 1000 kilograms in a single day sometimes during weekends! Tourists, but also people from Chongqing, are crazy for this kind of twisted biscuits; moreover, Ma Hua is a low-calorie food, rich in proteins, vitamins and micronutrients. After our snack, we continued towards the Lun Bao Buddhist temple. History tells us that Jianwen, Emperor of China’s Ming Dynasty, after being ousted from Beijing and sent into exile, spent the rest of his life in this temple. Before entering the temple, we stopped to chat with Wan Yu, a girl originally from Shanghai, who moved to Chongqing two years ago because of love, and who is now the owner of a shop selling religious articles. She is Buddhist and passionate of Buddhist objects. When she arrived in Chongqing, she learned about the presence of this temple and went to visit; there she met Liu, who is also passionate about these objects, and together they decided to open the shop you can now find at the foot of the temple. The business is going very well, and her products are appreciated also by foreign tourists from time to time. We thanked Wan Yu and went to visit the temple. The main building was built 600 years ago during the Ming Dynasty; the whole structure was built without using a single nail and in China’s architectural history is considered as a miracle. Buddhist believers come to this temple to pray and undertake other Buddhist activities, particularly during Chinese New Year. It was then almost lunch time, so we started looking for a place to eat and we ran into Ciqikou’s oldest restaurant. Mr. Zhang, a cheerful 76-year-old grandfather, has been working there for 30 years and his specialty is xiaomian. 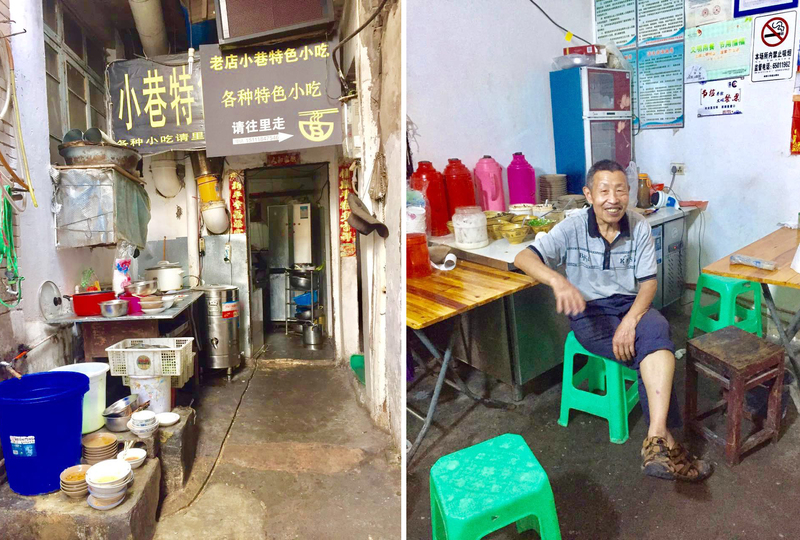 Ciqikou has changed a lot and has undergone several renovations, but him and his restaurant have not moved since. He is now old and considering of leaving the business in the hands of his son, and spending his days fishing. When Mr Zhang opened the restaurant, Ciqikou was not a tourist destination yet, and vistiors were really few. 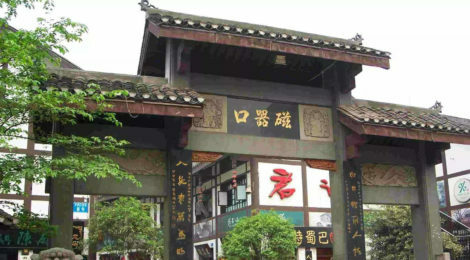 Now, with the proximity of Chongqing University, many foreign students come to the old town and go to eat at his restaurant. However, Ciqikou is not just about the old times, there are also many nice hotels and bars which are very popular among young people, and where you can enjoy live music performances. We could not leave the town without entering in a shop of chili, symbol of Chongqing. Mrs Wang welcomed us into her shop, the second business selling chili inside Ciqikou. The first was opened ten years ago, while the second seven years ago. Chongqing people love eating spicy food, so this is a very good business. Usually she sells around 200 kilograms of chili pepper every day only in this shop, but also Sichuan pepper and mixed-spices used for hotpot are very demanded. She told us that she even had a foreigner as regular customer, with whom she became friend. This old town takes you back in past and make you forget away for a moment the chaotic and frenetic city life. If you decide to visit Ciqikou, remember it can be very crowded during weekends!